During the winter months it is not uncommon for rats or mice to seek shelter from cold or wet weather and move indoors. Very often they can survive on sources of food left unattended, or chew into food packets. Vermin can live in attic spaces which are well ventilated and well insulated. They can navigate their way through wall cavities and access ducts for pipework etc. 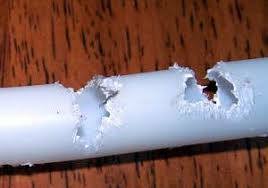 If rats or mice get desparate for nourishment they can chew into PVC pipes to get to a water source. Such damage can start as a trickle but can quickly deteriorate to cause significant leaks. In many household insurance policies there is an exclusion under the ‘accidental damage’ peril for “Damage caused by wear and tear or gradual deterioration, insects, vermin, corrosion, rot, mildew, any process of cleaning, dyeing, repairing etc, electrical and mechanical breakdown or malfunction”. What many fail to understand is that the same policy covers a separate peril for “Escape or overflow of water from any fixed domestic water or heating installation”. There is no such exclusion for vermin under the escape of water peril. Therefore the standard household policy will cover the damage caused by the water, but not the cost of repairing the pipe (which is usually a small figure). Some insurance company staff will decline a customers claim by quoting the exclusion mentioned above by simply saying the policy excludes loss or damage caused by “vermin”. While this may be technically correct in respect of the damage to the pipe (in the same way that wear and tear on pipework is excluded), this is wrong in respect of the resultant water damage, which can be very significant and costly to repair. If you have rats or mice in your premises you should take it very seriously. Elimination requires dedication and persistence in setting traps and continuing to set traps for as long as it takes to be sure there are no further vermin present. If you cannot stomach the task of setting traps and disposing of the dead mice or rats, you should call in a professional pest control company. If you have a claim, you should call Balcombes!